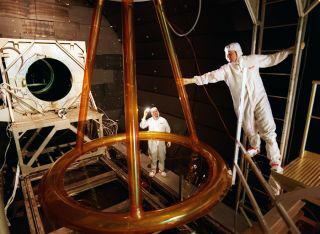 The Shooting Star Experiment, run in 1997, tests the technology developed for using the Sun's energy for inexpensive space propulsion research. In this historical photo from the U.S. space agency, the Shooting Star Experiment (SSE) is designed to develop and demonstrate the technology required to focus the Sun's energy and use the energy for inexpensive space propulsion research. Pictured is an engineering model (Pathfinder III) of SSE and its thermal vacuum test to simulate in-orbit conditions at the X-Ray Calibration Facility at the Marshall Space Flight Center (MSFC). This model was used to test and characterize the motion and deformation of the structure caused by thermal effects. In this photograph, alignment targets are being placed on the engineering model so that a theodolite (alignment telescope) could be used to accurately measure the deformation and deflection of the engineering model under extreme condition, such as the coldness of deep space and the hotness of the Sun, as well as vacuum.